TATS A KOOL CHALLENGE: Chocolate! It was all the fault of April 1st!! 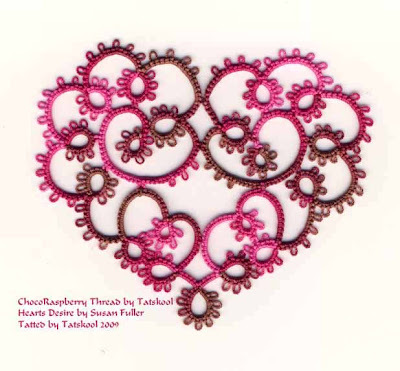 No not April Fool's day but International Eat Chocolate Day plus do some tatting if you have time, Day!! Then there was Easter and more chocolate temptation. Tatters love chocolate but it does tend to try to make us ...! 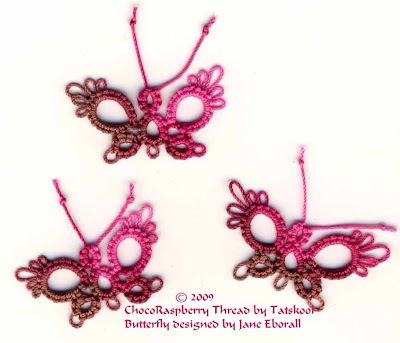 Someone suggested chocolate thread so that we could eat our tatting....at least that's what I think they said! So that got me thinking....if we tat with chocolate thread maybe we won't need to eat so much chocolate....well that's the theory! It just so happened that I had got a bunch of new dye colours and one of them was..guess what...chocolate...that had to be prophetic didn't it!! Too much chocolate..even thread is..well...too much chocolate..so let's go for some fruity chocolate desserts. 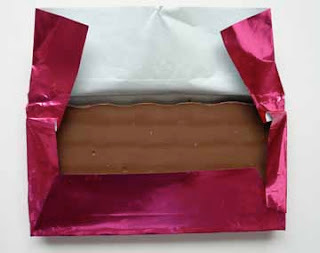 Now it just so happens that my favorite milk chocolate is packaged in the most divine pink foil wrapper (usually eat dark chocolate but love this one). It made me think of chocolate and raspberries...mmm! yummy! 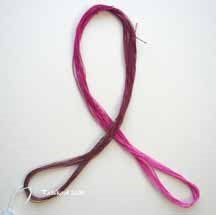 Dyed my first trial and showed it to the house elf (even tho' pink is not an elvish colour). 'Mmm!' he said not wanting to offend..'it's not as nice as your other ones!' and I kind of agreed! The thing is that once you have reached perfection, nothing else is ever going to be as good! I peaked too soon as my first colour combos were so fab that I have got stuck in a colour rut! I had to break free...cue for a song! Back to my narrative.... I tatted my 14yd sample into my favorite Susan Fuller Hearts Desire heart and showed it to the house elf and he liked it...he really liked it!! It's very subtle he said and my tatting friends liked it too and said the very same thing, it's subtle...and so it is, even tho' the actual colour change is quite dramatic..it is subtle. And so ChocoRapsberry was born. Want to see it...yes of course you do. With the thread left over I tatted my favorite Jane Eborall SCMR tiny butterfly..it's perfect for the job as it takes about a yard of thread so shows all the colour changes. So let me tell you a bit more about this yummy dessert. Imagine if you will a tall sundae glass...at the bottom are fresh raspberries...on top of that is a raspberry mousse with just a hint of chocolate to liven it up...on top of that is a chocolate mousse with a hint of raspberry to stop it being too sickly....Top all that with chocolate ice cream or chocolate sauce if you prefer...and a chocolate flake or maybe a sprinkling of raspberry butterflies dipped in chocolate. Methinks that I will make a series of chocolate desserts so watch out for more. 'Hot' Chocolate 'cos this thread is HOT or should I say COOL! With my first full skein I tatted another Spinning Wheel Glassmat...this pattern by Mary Konior is perfect for showing off HDT..it's just one of those designs while works so well as the rings and chains follow each other in unbroken sequence. I have to admit that I love this thread every bit as much as my others. It just hits my chocolate spot! 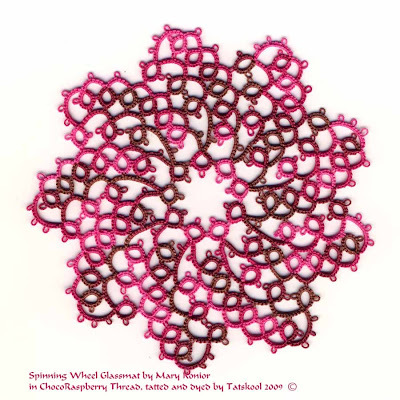 I have to admit that tatting with chocolate thread is addictive and it makes me want to eat more chocolate not less!! but I have to resist. Do please leave a comment and tell me what you think, each and every opinion is valuable. Addendum..I don't think this is like anyone else's thread..I hope not. I love it - beautiful! Thanks Gina... thought you might. Hmmmm, even miserable old gits like me who doesn't much like variegated threads is impressed with this one. Could it be to do with the word 'chocolate'? My nemesis!!! I do like this one. Thanks Jane, that's praise indeed.perhaps I should label it as less fattening thread! My mouth is watering! Tatting and chocolate... the perfect combination! Very, Very Nice Pamela! Beautiful color with a name that fits it perfectly!!! The Hearts Desire and Spinning Wheel both look fantastic in this thread. I love it. The colors are wonderful. Your description made me crave a decadent dessert. Oh Pamela, you just know how to whet a person's appetite for HDT, and chocolates. I love chocolates too. Yum! I can envision chocolate-covered-strawberry (brown with more red rather than pink), chocolate-mint (brown and light green), and chocolate-vanilla. Ooh, how about Neopolitan? Also, though not a dessert, a woodland-themed brown with medium to dark green. It's magical! - that first sample you showed didn't look very startling, but when it was tatted into the heart, it came to lofe - it's wonderful, an inspired colour-choice! Hi Ladytats,Diane,Carol, JB and Jon..thanks for topping by and leaving a comment, they mean so much. Oh Miranda you are obviously hooked, your ideas are great and some are near to my future aims. the idea of the browns and greens is great too...but I hate Neopolitan Ice cream, too busy..too many flavours in the ice cream and also in the thread..for me that is. Hi Maureen you are so right, sometimes that happens, they come to life when tatted and sometimes I just like to look at HDT in the skeins and don't want to tat with it. I love this color combo. Very pretty. If you are considering requests though,my favorite color combo is a robin's egg blue and brown. IF that combo shows up I will be in chocolate heaven. Oooh delicious! I must have some. Have you ever put all the color samples of Hearts Desire and SCMR butterflies together in one post? I'll bet they look fabulous! how pretty!!! I can smell the chocolate from here! Oh, Chocolate and Raspberry are one of my flavorite combinations!!! Hi Fox, glad you are drooling!! Hi Connie, may take a while to get to Robin's egg blue especially as I can't eat it! but I will try. Hi Steph, yes I must do that when i have time and have a few more threads finished. My brain is in chocolate overdrive!! Hi Nancy, I keep wafting it your way! Hi Chic, Thanks for the complement, those colours do work together so well. Oh, MY! 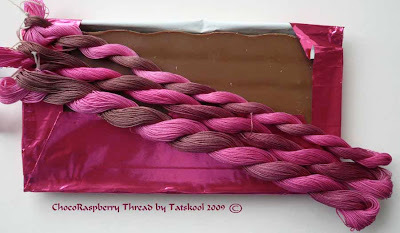 Love the chocolate raspberry thread! Actually I have just found your threads, courtesy of Mimi! Your colors are fabulous... makes me want to learn to dye! I love the thread color! It really looks good enough to eat! This thread is scrumptious! I must have it. Thanks Lauren, mica, Tattycat and Ridgetatter for saying such nice things, you inspire me to do more yummy desserts. This had been such fun. I want some I want some! Oh, that is my very favorite thing, Raspberry and Chocolate...I want some!!!!!! Hi Carol, thanks, I hear you, I hear you!! Looking back a week or two. Back to earth....or in this case sea! Wonderful Weekend...the end is in sight! !